When using smartphones to assess mental health, researchers traditionally create apps that require the patient to manually update information. For example, for an app that helps track depression symptoms, you instruct the patient to either open the app, or respond to a notification on their phone to input various metrics. This technique isn’t ideal as you have to rely on the content to be updated manually by the end user, often perceived as a hassle. Researchers at Dartmouth created a study that addressed this issue by using an Android phone’s sensors to passively collect information. They created an app called StudentLife. The app collected the phone’s motion and location and the timing of phone calls and texts. The app kept track of sleep, kept an estimate of how often the person was involved in a face to face conversation (the microphone occasionally would be activated on the device), and had several other inputs. The study included 48 students and the app collected information for a 10 week term. The Android phone used was a Google Nexus 4. 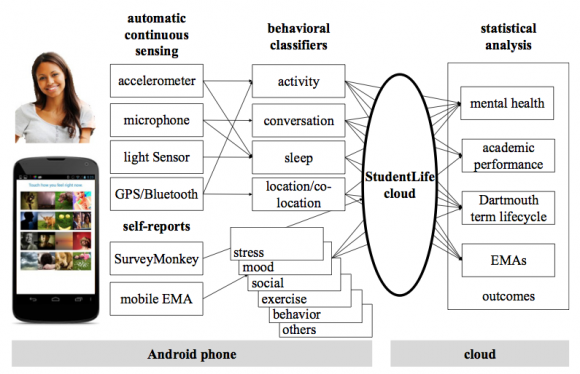 For the first time, based on a phone’s native sensors, researchers were able to correlate patterns in behavior to stress, depression, and loneliness — these patterns even correlated with grades. This study gives other researchers an example of how they can implement passive forms of data collection when studying behavior.